[시사뷰타임즈] 공작새 한 마리가 주류점에 걸어들어 오다니..
이 말은 농담을 시작하려는 것처럼 들리지만, 칼러포녀 주류판매점 주인에겐 하나도 재미있는게 아니다. 이 별난 공작새는 -CCTV에 고객들 및 어안이 벙벙한 가게 주인과 함께 찍힌- 월요일(5일),알키디아에 있는 로열 오욱 주류점 속을 헤집고 다니면서 500달러(60만원) 상당의 손해를 입혔다. 다행히, 마침내 이 새를 잡을 수 있었고 야생으로 되돌려 보냈는데, 야생에선 손해 좀 약간 덜 입히길. 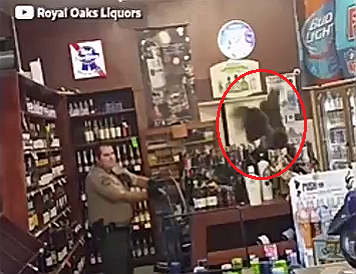 But for the owners of a Californian liquor store, the punch line was anything but funny. This particular peacock - caught on camera by CCTV, customers and bemused shop manager Rani Ghanem - caused $500 (£390) worth of damage after wandering into Royal Oak Liquor Store, Arcadia, on Monday. Luckily, animal control were eventually able to catch the bird, and it has since been released back into the wild - where it will do a little less damage, hopefully.